Empat Satu - thanoscardgamess jimdo page! 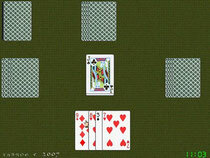 In this Indonesian draw and discard game, the aim is to collect four cards of the same suit with as high a point value as possible, 41 being the maximum that can be achieved. At your turn, you draw either the top card of the stock or the card just discarded by the previous player, add this card to your hand, and discard one card face up. If at the start of your turn you have four cards of the same suit, you can stop the game. The play ends immediately and everyone shows their cards. When the game is stopped (either by a player or because the stock has run out), all players show their cards and count their scores. Each player can only count cards of one suit as positive, and cards of other suits have a negative value.